Ich war durchwegs zufrieden. Auf der einen Seite ist genug los und man kann sich unter die Leute mischen, auf der anderen Seite hat man auch die Möglichkeit sich zurückziehen. Die Dachterrasse ist super und auch die angebotenen Yoga Einheiten (gratis) lassen einen entspannt in den Tag starten. Direkt im Hostel ist auch ein Reisebüro, wo man Touren buchen kann. Ich würd das Hostel definitiv weiter empfehlen. I think it‘s the best hostel I‘ve ever been to. The hostel has a good location and is very clean. I really liked the family atmosphere. The breakfast for USD 3.50 is amazing and the dinner for USD 5 is diversified! I would really recommend this hostel to everyone! Such an awesome hostel. Really nice atmosphere and easy to get to know other travelers. Rooms are nice, beds are comfy, staff is great. Nice chillout area with couch and Netflix. Downstairs they have their own tour agency for exploring the region. Pub crawl was really fun. The food: delicious. Belongs to the best food I've ever eaten in a hostel. It's not the cheapest hostel, but in my opinion totally worth it. Highly recommended. Good Bar Crawl. The bathroom situation can be annoying. Sometimes no hot water, and there are nice bathrooms but when they are occupied you have to go to some very basic ones. Really loved Community Hostel! 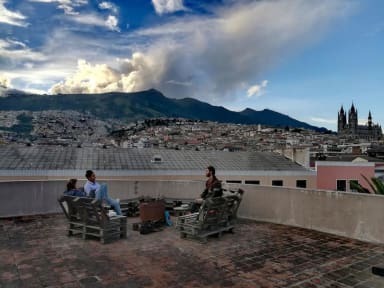 I have stayed in quite a few hostels in South America in this is by far the best! From the moment you step in, you feel welcome, the atmosphere is really nice, they have an amazing rooftop terrace with beautiful views, and the Community staff is lovely. Especially Gaby, a sweet little Ecuadorian lady who works at the reception made my stay there exceptional. I also stayed in their hostel in Baños and equally loved it. I will definitely come back! Very clean and spacious hostel. Please fix the stove in the travelers kitchen. A printer would be a welcoming plus. Otherwise great and positive place! I recommend it. Great hostel, but I felt unsafe at night in this area. Sehr unsichere Gegend, man sollte das Hostel nicht ohne Uber verlassen! Die Mitarbeiter haben uns gar nicht darüber informiert! Ansonsten schöne Zimmer, gemütliche und familiäre Atmosphäre! Feines Abendessen zu einem Aufpreis möglich.